It's hard to decide whether to describe Lark Lane as an eat street, as a shopping destination or as an entertainment hotspot. In truth, this quaint little lane in South Liverpool is all of those things. The media tend to describe it as somewhere between a bohemian oasis and a hipster's paradise. I just call it home. It's the perfect place to grab brunch with your brood, relax with a drink with your friends or simply wander through on your way to the park. Have a read, see what you think, and the next time you're looking for somewhere to hang out at the weekend, maybe you'll choose the lane. Whether you feel like getting your Greek on or are in a Mexican frame of mind, you're pretty much guaranteed to find a Lark Lane restaurant to suit. The nature of the lane means that many of the businesses act as restaurants in the day and bars at night, but there are a few designated restaurants knocking about. Good picks for a meal include the Red Fort (Indian) and Chy (Chinese), although for me at least, there's really no beating the Pad Thai at Chilli Banana. More relaxed eateries include Bistro Noir, Esteban, Marantos, Rhubarb and Que Pasa Cantina. A handful of the eateries on the lane fall more into the cafe category, and again, you can expect a good choice. Local favourites include Raggas - a Caribbean eatery serving up the most delightful veggie curry (among other dishes). There's also the fabulous Green Days - a vegetarian cafe above 13 Lark Lane Gallery, the Moon and Pea Bistro - a retro-style eatery known for its scrumptious breakfasts and cheeky slices of cake, and the Sri Lankan Deli - a newcomer to the lane that is quickly growing a local fan base courtesy of their homemade vegetable samosas. And then there are the bars. Unless there's an event on in the park, Lark Lane tends to be a bit sleepy during the day, but that all changes when night falls and the laid back restaurants crank up the tunes a notch and welcome the revellers. Hotspots include the American-style Meat and Liquor and Que Pasa Cantina where you'll find a relaxed vibe and one of the few beer gardens on the lane. Plus, there's Keith's Wine Bar - an old timer that's been around since 1979. The paint is peeling from the walls, but no one seems to care after a glass or three of red. If you can drag yourself away from the lure of the food and drink on offer, there's more than a few shops to explore on the lane. As you might expect, you won't find high street names down here (with the exception of the Co-Op fiasco). Instead you can delve into a treasure trove of galleries, antique shops, and delightful one of a kind stores. Don't miss Larks - an old fashioned gift emporium with a vintage chic vibe, GASP - where kitsch, classic and retro items are the order of the day, and Arts Hub 47 - a creative co-op showcasing the work of local artists. If you like your eggs straight from the hen's proverbial, then you'll want to swing by the Lark Lane Farmer's Market. Held on the fourth Saturday of the month at the Aigburth Road end of the lane, it's the place to go for an excellent choice of locally produced cheeses, specialist meats, flowers, plants, coffee, and -- you guessed it -- lots more. Plus, there's cake and lots of it. At the risk of being mistaken for a pensioner, you'll want to take a granny trolley along. Either that or break your back trying to get all your goodies home in one piece. Your call. The proximity of Lark Lane to Sefton Park typically means that when there's something on in the park, you can expect the lane to be heaving with visitors. It is after all a natural next step when events such as the Liverpool Food and Drink Festival, Africa Oye, and LIMF come to a close. There was some talk during 2013 about putting on a Lark Lane Festival, but the pesky officials at the council soon put an end to that chatter. To that end, specific Lark Lane events tend to be limited to the Lark Lane Book Club and the monthly arts and crafts markets at the Old Police Station. 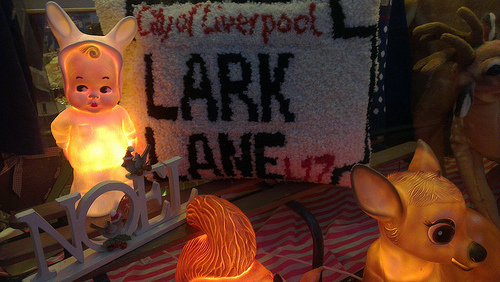 I hope you'll come and check out Lark Lane for yourself sometime soon. Perhaps you'll love this charming Aigburth hangout just as much as I do. For more information, check out the Lark Lane Guide.